Newly designed for 2016/17, the Schwinn MY16 430 is an impressive Elliptical Trainer Machine for home use, combining an ergonomic design for comfort with plenty of features to keep your workouts varied, challenging and motivating. The Schwinn MY16 430 Elliptical Trainer utilizes a high-speed high-inertia perimeter weighted flywheel together with ECB resistance (20 levels) that provides smooth, quiet and consistent momentum. 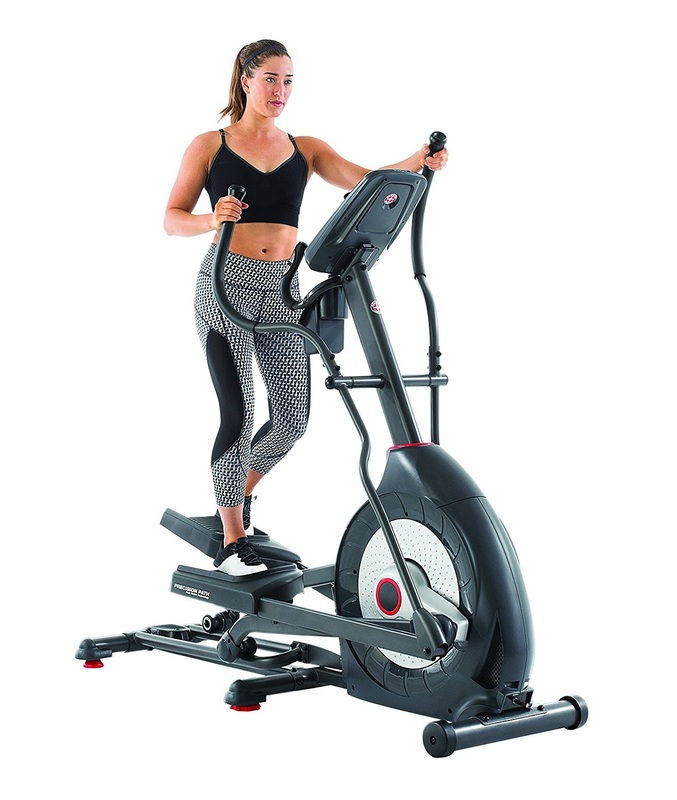 The Schwinn 430 Elliptical offers a 20” stride length combined with Precision Path Foot Motion Technology that simulates a natural running motion, while the large cushioned articulating footplates offer additional comfort to give you an overall effective yet low-impact workout. There’s lots of workout variety with the Schwinn MY16 430’s 22 preset programs, including 9 profile, 8 heart-rate, 2 custom, 2 fitness test and 1 Quick start program. There are 20 levels of computer controlled resistance (with 10 Quick Keys for easy adjustments) so you can adjust the intensity of your workout and for additional challenge you can adjust the incline up to 10 degrees (manual ramp with 6 positions). The Schwinn MY16 430 Elliptical Trainer features dual action handlebars – manual and static – so you can hold onto the moving handlebars to work both your upper and lower body together for a more effective workout or just hold onto the static handlebars to work your lower body in isolation. The static handlebars feature built-in pulse grip heart-rate sensors so you can use the heart-rate programs to help stay within your target heart rate zone. 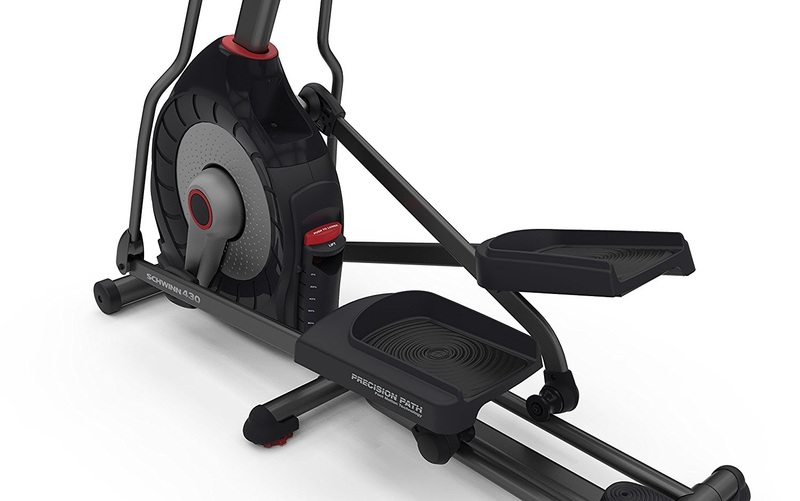 The Schwinn MY16 430 Elliptical Trainer comes with a newly designed streamlined console that’s easier to use yet is still packed with all the high-end features we’ve come to expect from Schwinn fitness machines. The console features a Dual Track 2 LCD window system with a 3”x5” main screen and 1”x5” secondary screen. The screens display motivating workout stats including time, speed, distance, calories, pulse, RPM, heart-rate zone, intensity meter, % complete, goal achievement. The Schwinn 430 offers 2 user profiles and the console offers Performance Tracking with Goal Tracker and you can also export your workout data via USB to Schwinn Connect and My Fitness Pal. 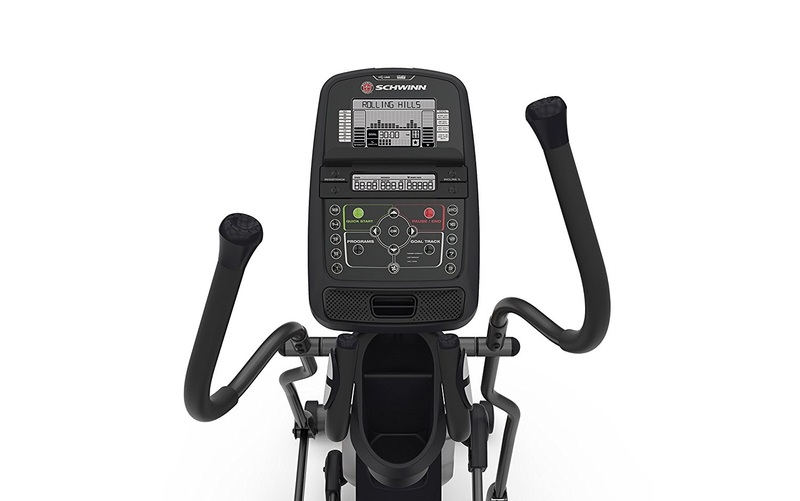 Additional premium features on the Schwinn 430 Elliptical include an acoustic chamber sound system with MP3 input, USB charging port/data export, media tray, adjustable 3-speed fan, water bottle holder. 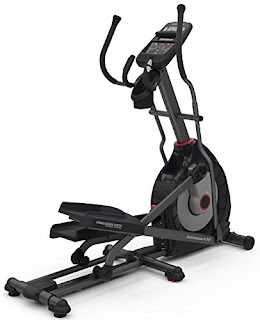 The Schwinn MY16 430 Elliptical Trainer Machine is sturdily built with 2 integrated levelers for added stability and offers a maximum user weight capacity of up to 300 lbs. Let’s take a closer look at the features and specifications of the Schwinn MY16 430 to help you decide if it’s the best elliptical trainer machine for you. Schwinn Fitness equipment has long been trusted for its exceptional quality, durability and affordability. Ideal for home use, the Schwinn MY16 430 Elliptical Trainer has plenty to offer both beginners and more advanced fitness enthusiasts. You’ll love the range of programs and resistance levels to keep you motivated and challenged – there’s something for everyone – start off and progress at your own pace! With the Schwinn 430, you also get the added advantage of the Incline feature which you don’t usually find on an elliptical trainer at this low price point – the incline helps to add more intensity to your workouts and engages more muscle groups for a more effective workout. You’ll also love the entertainment features on the Schwinn 430 – plug in your MP3 player to the console’s speakers and listen to your favorite music as you exercise – the time will fly by! Alternatively place your tablet or smart phone in the media tray, watch TV and more to keep yourself entertained. The Schwinn 430 is ergonomically designed to give you a comfortable workout and elliptical trainers in general are known for their effective low-impact workouts, meaning that they are easier on the joints compared to many other forms of exercise. In fact, elliptical trainers and exercise bikes are one of the easiest forms of exercise to stick to in the long term to help you achieve your fitness goals. Schwinn 430 versus Schwinn 470 Elliptical Trainer Machine 2013, What's the Difference?